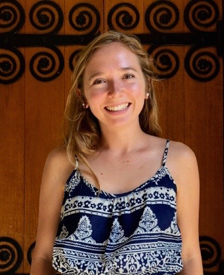 This interview was conducted over email with Isabella Arbelaez, a senior undergraduate student enrolled in the Human Rights Certificate Program, majoring in Global Literature and Cultural Theory, by Miranda Gershoni, a first-year undergraduate student working for the Duke Human Rights Center at the Franklin Humanities Institute. Isabella Arbelaez (IA): I have had a passion for working with migrant populations, specifically with youth. As the daughter of a Colombian immigrant, the opportunities I was provided during my childhood were made possible through the work of my abuelos, my grandparents, and their decision to come to the United States. But I recognize that these opportunities are not available to all students. Rather, migrant and refugee youth in our country are systematically put at a disadvantage because of the institutional barriers set before them – those of prejudice, racism, classism, and discrimination. IA: I knew from the first day of Dr. Robin Kirk’s “Introduction to Human Rights” course that this certificate would be different. Dr. Kirk actively engaged her students, whether it be discussing current human rights issues or prepping for course quizzes through what she called, “Human Rights Jeopardy.” The same could be said about the certificate itself – it encourages students to engage in the issue, both in and out of the classroom. IA: What I have loved most about this certificate program is the ability to truly make it my own. I was introduced to the certificate through Duke Immerse, a semester-long program that truly “immerses” students in a current international issue, whether it be the refugee crisis in the Middle East, human rights in Latin America, or food policy in the United Sates. I was able to explore my particular interests in refugee studies, while bringing my real-life, travel experiences to the classroom. IA: Recognizing my passion for human rights and education, I hope to use the knowledge and experiences I have gained through the certificate to change the future of education for refugee and immigrant populations in the United States. This upcoming year, I will be moving to Boston to teach English as a Second Language for Teach for America. Following TFA, I hope to go to law school for international human rights, integrate my time in the classroom into a global framework, and continuing to be an advocate for international educational equity. IA: My sophomore spring semester, I traveled abroad to Amman, Jordan through the Kenan Institute Duke Immerse program, “Deconstructing/Reconstructing the Refugee Experience.” Under the guidance of Dr. Suzanne Shanahan, our team of seven students spent four weeks in Amman taking field notes and interviewing Syrian and Iraqi refugees on their displacement experiences. My time abroad was invaluable; it is one thing to study a global crisis on paper and another to see its community personal and ramifications.